ANCHORAGE, Alaska -- A Utah man killed his wife aboard an Alaska cruise and told an acquaintance who later walked into the blood-splattered cabin that he did it because she would not stop laughing at him, the FBI said in documents released Thursday. Kenneth Manzanares was found in the couple's room on the Princess Cruises ship Tuesday night with blood on his hands and clothes and blood spread throughout the cabin, according to a criminal complaint by FBI Special Agent Michael L. Watson. The agency said the 39-year-old woman, identified only as K.M., had a severe head wound but didn't reveal any other details about her death. 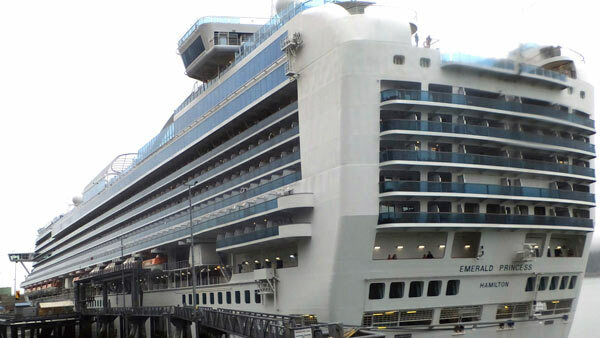 Manzanares was arrested aboard the 3,400-passenger Emerald Princess that had left Sunday from Seattle. Before medical workers and security officers responded, a man and others went into the cabin and saw the woman on the floor covered in blood, according to court documents. Manzanares grabbed his wife's body and dragged her to the balcony before the man stopped him, Watson wrote. A ship security officer handcuffed Manzanares in a nearby cabin, and he was taken into custody late Wednesday. The ship was diverted to Alaska's capital city because of the investigation, which the FBI is leading because the death occurred in U.S. waters. The ship docked in Juneau on Wednesday morning, and passengers were kept on board for hours before the cruise departed late that night for the southeast Alaska town of Skagway. Princess Cruises said in a statement Thursday that passengers will receive $150 onboard credit because of the effect on their vacations. "You feel sorry for the family but a lot of people had to wait," said Lloyd Barrows, a passenger from Alberta, Canada. The U.S. attorney's office announced it would hold a news conference with representatives of the FBI and Coast Guard on Thursday in Anchorage to announce federal charges against Manzanares. Bohrer reported from Juneau, Alaska.